You'll be £19.99 closer to your next £10.00 credit when you purchase Conquerors of the Roman Empire: The Goths. What's this? In the late 4th century, pressure from the Huns forced the Goths to cross the Danube into the Roman Empire. The resultant Battle of Adrianople in 378 was one of Rome’s greatest defeats. Both western (Visigoth) and eastern (Ostrogoth) branches of the Goths had a complex relationship with the Romans, sometimes fighting as their allies against other ‘barbarian’ interlopers but carving out their own kingdoms in the process. Under Alaric the Visigoths sacked Rome itself in 410 and went on to establish a kingdom in Gaul (France). They helped the Romans defeat the Hunnic invasion of Gaul at Chalons in 451 but continued to expand at Roman expense. Defeated by the Franks they then took Spain from the Vandals. The Ostrogoths had a similar relationship with the Eastern Roman Empire before eventually conquering Italy. Adrianople, the events of 410 and the Ostrogoths’ long war with Belisarius, including the Siege of Rome, are among the campaigns and battles Simon MacDowall narrates in detail. He analyses the arms and contrasting fighting styles of the Ostro- and Visi- Goths and evaluates their effectiveness against the Romans. The author tells this story with hindsight and in depth while analyzing the origins of this people and the differences that will gradually appear between Visigoths and Ostrogoths. This book is a good complement to the Vandals book by the same author. Adrianople, the events of 410AD and the Ostrogoths' long war with Belisarius, are among the campaigns and battles Simon MacDowall narrates in detail. At the time, the Roman empire and its army must have seemed invincible. 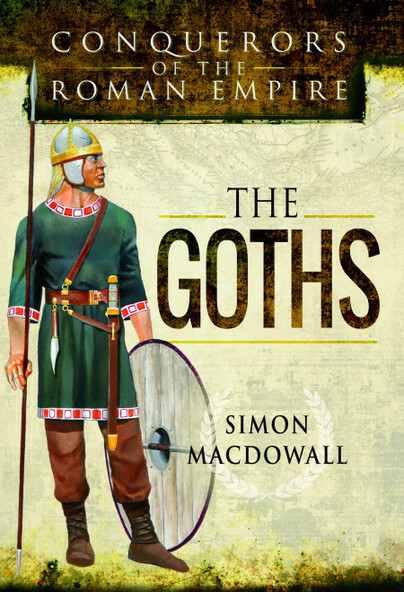 The Goths were a race that simply would not accept defeat, and in this fascinating account of their history, author Simon MacDowall opens our eyes to their strengths and weaknesses, and looks at the various campaigns that built them into the fearsome fighting machine they ultimately became.